Aim: The study aims to evaluate the effectiveness of tibial nerve block with phenol on ankle plantarflexion and inversion spasticity caused by the upper motor neuron lesions. Materials and Methods: A single-center retrospective study was undertaken to assess the effectiveness of tibial nerve block on the spasticity of ankle plantar flexors and invertors in upper motor neuron lesions. Forty-four patients with ankle plantar flexion and inversion spasticity were included in the study. Clinical outcomes were measured before tibial nerve block at 6 and 24 weeks following the treatment. The outcome measures included Modified Ashworth Scale (MAS), the passive range of motion of the ankle dorsiflexion with the knee in a flexed position and with the knee in an extended position. The patients were advised to continue with the pharmacological and nonpharmacological interventions such as medications, splinting, and stretching. Friedman test of differences among repeated measures was conducted from data at 0, 6, and 24 weeks. Results: There was a statistically significant difference between the baseline MAS and ankle passive range of dorsiflexion motions (both with the knee flexed and extended) measured at 6 and 24 weeks following the phenol nerve block of the tibial nerve. Conclusions: This study highlights that phenol nerve block of the tibial nerve helps to reduce the spasticity of the ankles when combined with other pharmacological and nonpharmacological interventions such as splinting and stretching. Ankle plantar flexor spasticity can lead to postural abnormalities and alter the biomechanics of walking. The ankle plantar flexors act eccentrically to control the ankle dorsiflexion caused by the ground reaction force moving in front of the ankle in mid-stance phase and terminal stance phase. Inability to perform active ankle dorsiflexion resulting from the spastic plantar flexor muscles (gastrocnemius and soleus) and the weakness of the dorsiflexors (tibialis anterior) will not generate enough forward propulsive thrust during the toe-off period of the gait cycle. Hence, there would be an insufficient transition from stance to swing phase. In the swing phase, if the ankle remains in plantarflexed position due to spasticity, the foot would drag along the ground causing an increased risk of falls. Phenol was first isolated from coal tar in 1834. Despite the harmful effects of phenol on living tissue, it has some potential anesthetic and physiological properties that can be used in modern medicine. Phenol nerve blocks have been used to treat spasticity for many years. The first use of phenol as antiseptic agent was in 1867 by Sir Joseph Lister also known as the father of modern surgery. Nathan in 1959 published the first use of phenol in the treatment of spasticity through intrathecal route. Khalil and Betts in 1967 first published the peripheral use of phenol as a neurolytic agent. Since the initial use of phenol, alcohol was also used for neurolysis in the treatment of spasticity. Carpenter and Seitz reported the use of intramuscular alcohol in the treatment of spasticity in cerebral palsy patients. Phenol has local anesthetic properties at low concentration (<2%), and at a concentration of 3% and higher, it causes protein denaturation and axonal destruction with occlusion and fibrosis in microcirculation around the nerves. With the widespread use of botulinum toxin injections for spasticity, the use of phenol has declined for many reasons. The botulinum toxins A (BoNT-A) injections take less time to perform and do not have the risk of causing neuropathic pain. The risk of developing neuropathic pain is the main driver to use BoNT-A injection for many clinicians. However, it is still a very useful skill to have for relief of spasticity in ankle plantar flexor and invertor muscles for patients who do not tolerate BoNT-A injections and has developed antibodies limiting the effects of further injections or in widespread spasticity where the maximum dose of BoNT-A has been achieved. The low cost of the phenol as compared to BoNT-A is the main advantage and a reason to use it for spasticity. Phenol nerve block is also a useful technique where patients are not able to attend frequent clinical appointments every 3–4 months as phenol has a longer duration of effect. The purpose of this study was to investigate the potential benefits of phenol tibial nerve block on the ankle range of movements and correlate it with Modified Ashworth Scale (MAS) scores. This is a retrospective study of all patients who underwent tibial nerve block with phenol in the regional spasticity clinic between December 2014 and August 2016. All the patients were reviewed by a consultant in rehabilitation medicine in the spasticity clinic before the procedure. There were several goals of tibial nerve block recorded in every patient and the most common were “improvement in walking,” “ability to tolerate the splints,” “increase joint range of movements,” “decrease clonus,” and “prevent further contractures.” Spasticity was assessed by MAS in the ankle plantar flexors and invertors. The ankle passive range of movement was measured first with the knee in 90° of flexion and then with the knee in full extension. The passive ankle range of movement was recorded between 0° and 90°. These two positions were selected to differentiate spasticity of the gastrocnemius and soleus muscles. Gastrocnemius crosses both knee and ankle joints and is tested by ankle range of movement with the knee in an extended position whereas the soleus spasticity is tested with the ankle range of movement with the knee in a flexed position. The patients who had fixed soft-tissue contractures of the ankle plantar flexors (complete loss of passive range of movements of the ankle), dystonia, deep vein thrombosis, or a history of adverse reactions to phenol were excluded from the study. The patients were consented on the day of the procedure by the consultant in rehabilitation medicine. If patients were on warfarin, this is stopped 3 days before the procedure, and international normalized ratio (INR) was checked on the day. Injections were performed only if the INR was <3 on the day. All procedures were performed by the same clinician. Patients were placed on the couch in lying position and then turned either to the lateral position or onto their abdomen if possible. The posterior knee crease was identified and marked with a skin marker. A point in the middle of the knee crease was marked [Figure 1] and [Figure 2]. This was the starting point to find the nerve with a nerve stimulator using the surface electrode. The aim was to avoid the sensory nerve fibers and target the motor branches to soleus, gastrocnemius, and tibialis posterior muscles. Once the nerve was located, the stimulator was moved in all direction to identify the point of maximal stimulation. The point of maximal stimulation was marked again and used as the point of needle entry. The skin was prepared with an antiseptic solution, and 0.5 ml of 1% lidocaine was injected at the site of the needle entry. Care was taken not to inject the local anesthetic very deep to avoid going close to the nerve. A 22-gauge (80-mm length) insulated nerve block needle was then inserted at the entry point marked connected to the syringe containing phenol. The needle was advanced 2–2.5 cm, and the nerve was stimulated through a nerve stimulator (PAJUNK MultiStim SENSOR stimulator) starting with 1 mA current at 2 Hz frequency to obtain a distal motor response. The lowest current producing a response was identified [Figure 1] and [Figure 2]. Two milliliters of 5% phenol was injected and the nerve was stimulated again. If there was distal motor response, 1 ml of 5% phenol was injected again until there was no further distal motor response observed. Patients were discharged home after the injections. We only used nerve stimulation to localize the nerve, and ultrasound was not used due to the nonavailability in our clinical setting. Physiotherapy assessment was arranged before the injections and continued after the procedure. Patients who were capable of doing their exercises were given home exercise program after their assessment in the spasticity clinic, and they were advised to continue with the program after the injections. The home exercise program included regular stretching of the ankle plantar flexor and invertor muscles. In ambulatory patients and patients who were managing their transfers independently, a diagnostic tibial nerve block with local anesthetic was performed before the phenol injection. Patients were advised to re-start their warfarin on the same day. All patients were followed up in the spasticity clinic at 6 and 24 weeks. MAS of the ankle plantar flexors and the passive ankle range of dorsiflexion were measured with the knee in 90° of flexion and with the knee in full extension at the 6 and 24 weeks following the injections. Any side effects were also recorded during the procedure and at 6 and 24 months. Demographic data were summarized using the descriptive statistics. Normality of the data was tested using Shapiro–Wilk test. As the data were skewed, Friedman test (nonparametric) was used to measure the difference between repeated measures of MAS and ankle range of movements with the knee-flexed and knee-extended position. The level of statistical significance was set at P < 0.05. All analyses were carried out in SPSS 24.0 (IBM SPSS, Chicago, IL, USA). A total of 44 patients underwent phenol nerve block with 5% phenol between November 2014 and June 2016. There were 26 (59%) males and 18 (41%) females. The age range was 22–82 years with a mean age of 56.9 years. Ischemic stroke was the most common diagnosis (34.1%) followed by multiple sclerosis (31.8%). The diagnostic groups are summarized in [Table 1]. The average dose of phenol 5% used for one block was 5 ml. All patients were using ankle-foot orthosis (AFO) before the injections and were advised to continue using it after the injections. Home exercise program was prescribed for 31 (70.4%). Twenty-eight (63.6%) patients underwent diagnostic nerve block with local anesthetic before phenol block. The median MAS before the tibial nerve block was 3 which dropped to 1+ at 6-week follow-up and to 1 at 24-week follow-up appointment [Figure 3]. 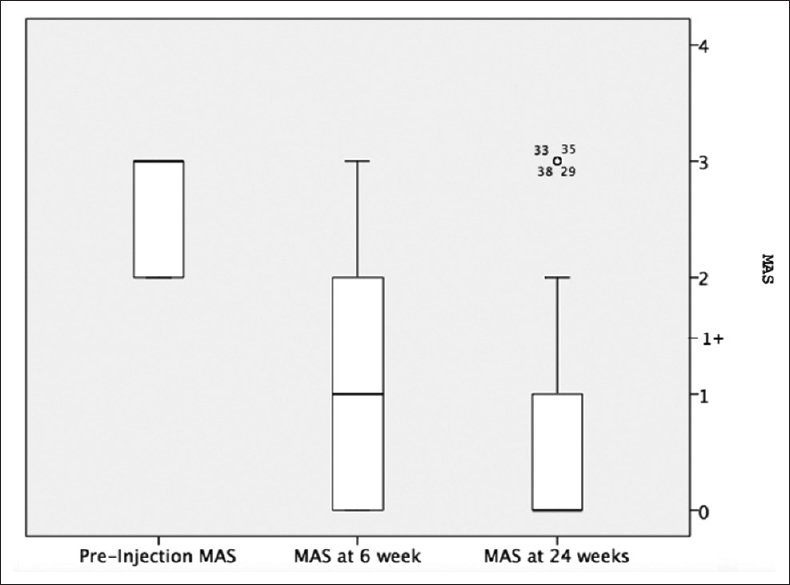 There was a statistically significant difference between MAS before the tibial nerve block and at 6 and 24 weeks' interval with a Chi-square of 68.9 (P < 0.01). The passive ankle range of movement was measured relative to the neutral ankle position (0° of dorsiflexion) with the knee-flexed and knee-extended position. The mean passive ankle dorsiflexion was −16.3° with the knee in flexed position before the phenol block, and at 6 weeks, this was reduced to a mean of −6.9° and −5.1° at 24 weeks after the phenol block [Figure 4]. 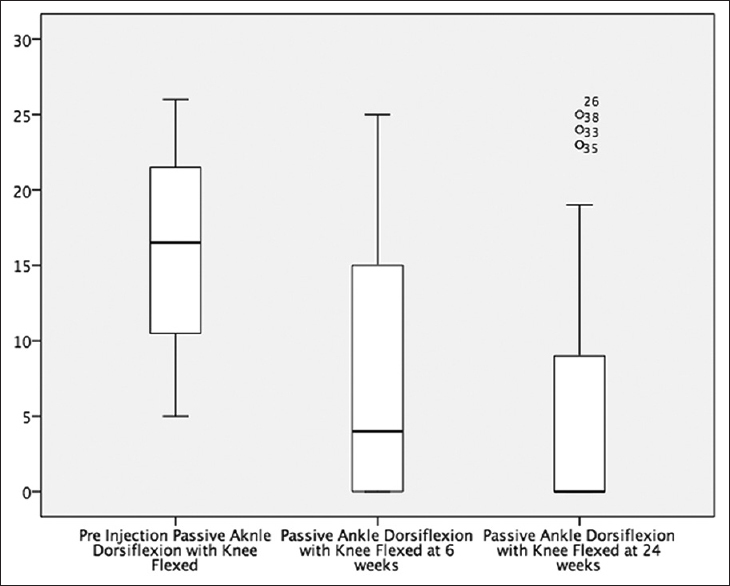 There was a statistically significant difference between the passive ankle dorsiflexion with the knee in flexed position before the injection and at six and 24 weeks' interval (Chi-square = 68.7 and P = 0.00). 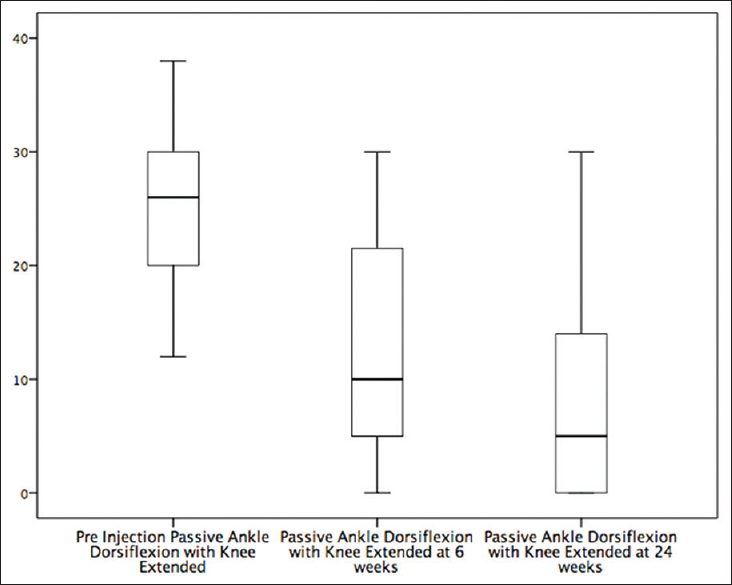 The mean passive ankle dorsiflexion with the knee extended was −24.7° before the phenol tibial nerve block and reduced to a mean of −12.0° at 6 weeks and a mean of −7.82° at 24 weeks [Figure 5]. Similarly, Friedman test also demonstrated a statistically significant difference between the passive ankle dorsiflexion with the knee in extended position before the injection and at 6 and 24 weeks' interval (Chi-square = 71.3 and P = 0.00). These results are shown in [Table 2]. The duration of effects of the phenol, in our study, ranged from 6 weeks to 6 months. 36 (81.8%) of patients demonstrated reduced spasticity at 6 months. The side effects were rare in our study group. Only 2 (4.5%) patients developed bruising and pain around the injection site which was transient and resolved spontaneously. One (2.2%) patient developed muscle spasm and neuropathic pain which lasted for 6 weeks and responded to pregabalin 100 mg twice daily. Since the discovery of botulinum toxins A (BoNT-A), the use of phenol as a neurolytic agent has declined. Although BoNT-A is used very frequently in the treatment of spasticity in a variety of upper motor neuron lesions, the effects of BoNT-A vary when treating spasticity in the larger muscle groups from one patient to another. Similarly, the effects of BoNT-A last between 3–6 months and repetitive injections at variable intervals are required to maintain the effects of the toxins. Phenol nerve and motor point blocks, on the other hand, seem to provide long-term effects in managing spasticity and could be useful choice in individuals who are not able to attend the clinical appointments on a regular basis due to transport issues and those who are not able to pay for BoNT-A, especially in low-income countries and patients who do not have adequate health insurance to cover the cost of BoNT-A injections. In our study, duration of effect of phenol nerve block ranged from 6 weeks to 6 months. In most patients, there was some minor return of spasticity within 6 weeks, but the majority (81.8%) retained a useful reduction of spasticity at 6 months, unlike BoNT-A injections where the effects last for 3–4 months. Chua and Kong reported the clinical and functional outcomes after alcohol neurolysis of the tibial nerve for ankle-foot spasticity in 2001 and showed that the average duration of effect was 10.5 ± 8.9 months. In our experience, phenol nerve blocks are useful in generalized spasticity in advanced multiple sclerosis, cerebral palsy (Gross Motor Function Classification System Grade IV and V), severe traumatic brain injury, stroke, and prolonged disorder of consciousness. The tibial nerve block with phenol is a clean procedure and can be performed in an outpatient facility and inpatient and in the community setting. In our study, all the procedures were performed in the outpatient setting. Karri et al., on the other hand, published their practice patterns of phenol neurolysis procedures conducted for spasticity management and performed the majority of their procedures during the inpatient stay. The authors also propagated that the early use of peripheral neurolysis with inpatient therapy optimizes the beneficial effects of neurolysis. Wichers in 1991 performed partial chemical neurolysis of the tibial nerve with phenol in 19 stroke patients and suggested that the phenol nerve block of the tibial nerve in the early recovery phase of stroke rehabilitation may be useful with equinovarus position of the ankle which interferes with therapeutic exercises and functional progress. We believe that the use of phenol nerve block, especially to the tibial nerve, should be used very cautiously in the early phase of the recovery as it is a destructive procedure and may interfere with natural recover in the early phase. Spasticity is not always harmful, and some individuals may use spasticity in various functional activities such as mobility, transfers, and maintaining personal hygiene. In such circumstances, any treatment option may result in functional deterioration of the patients. As the effects of phenol usually last for several months, the potentially harmful effect in theory may continue if the spasticity is treated. To avoid this, it is our usual practice to perform a diagnostic tibial nerve block with local anesthetic (levobupivacaine) in all patients who are ambulatory and who are managing their transfers independently. The effects of diagnostic local anesthetic block last between 48 h and 72 h and are helpful in guiding the treating clinicians with the further management of the spasticity. Phenol nerve block is then carried out depending on the results of the diagnostic local anesthetic block. Deltombe et al. in a recent article highlighted the clinical importance and advantages of the diagnostic nerve block in managing spastic equinovarus foot deformity after stroke. Following a local anesthetic nerve block, additional precautions should be taken to ensure that the patients are supported in their home environment. For example, there should be an accompanying person to drive them home if they are not able to drive and need help with mobility, transfers, and activities of daily living. If patients are employed, they may need to take time-off work if needed. AFO would ideally be supplied before considering this diagnostic local anesthetic nerve block for additional safety. The main reason that the most clinicians avoid using phenol nerve blocks for spasticity as their first choice is the risk of causing dysesthesia in the distribution of the treated nerves by phenol. The incidence of postinjection dysesthesia in the published literature following phenol block ranges from 2% to 32%., This is due to the phenol causing damage to the sensory nerve fibers. The dysesthesia could last a variable amount of time and in some cases could be permanent. The tibial nerve is a mixed sensory and motor nerve, and in the popliteal fossa, the nerve gives off muscular branches, articular branches, and the cutaneous branch that would become the sural nerve. It is damage to this branch that causes dysesthesia. This could be avoided if the nerve block is done at the level of the posterior knee crease or just below it by combining the ultrasound and nerve stimulation to avoid the sensory nerve fibers and to target the motor nerve branches outside the tibial nerve trunk. Anwar et al. in 2017 reported a retrospective case series of phenol nerve and motor point blocks in the management of spasticity and reported that only one patient developed neuropathic pain. Similarly, Lee at al reported temporary and tolerable causalgia of fewer than 7-day duration in 7 patients in their series of 53 percutaneous nerve blocks under ultrasound guidance. The incidence of dysesthesia in our study was 2.2% compared to other studies where the reported incidence was 30% after tibial nerve phenol block. The other disadvantages of this nerve block are occasional local discomfort at the site of injection which usually passes off within hours, occasional transient paraesthesia, and potential risk of infection at the injection site. The latter complication has not yet been reported in our study. Systemic complications of phenol can occur if phenol is accidentally injected intravascularly resulting in cardiac arrhythmias, hypotension, cardiovascular collapse, seizures, and depression. The direct comparison of BoNT-A and phenol in treating ankle plantar flexor and invertor spasticity was investigated by Kirazli et al. in a randomized, double-blind trial. The trial concluded that both BoNT-A and tibial nerve block with phenol were effective in reducing the ankle plantar flexor spasticity, but the changes were more significant in the group that received BoNT-A at 2 and 4 weeks, whereas there was no significant difference between the two groups at 8 and 12 weeks. The efficacy of phenol and BoNT-A was also reported by Manca et al., where they compared BoNT-A with phenol in reducing the ankle clonus in patients with spastic paresis and found that both groups showed a significant reduction in ankle clonus with the effects of phenol greater than the BoNT-A. Kocabas et al. compared phenol and alcohol neurolysis of tibial nerve motor branches to the gastrocnemius muscle for treatment of spastic foot after stroke in 20 patients. In the alcohol group, spasticity was reduced in all 10 patients and maintained over the 6-month follow-up period in 9 patients, whereas in the phenol group, spasticity was reduced in all the 10 patients after the motor branch block and it was maintained over the 6-month follow-up in 7 patients. The most common complication seen in both the groups was postinjection local pain which was transient. One patient developed dysesthetic pain in the phenol group which was treated with gabapentin for 3 months. In the era of BoNT-A, the role of phenol could be seen as adjunctive therapy or an added tool in the management of focal or multifocal spasticity. It could also provide an alternate treatment where the BoNT-A injections are associated with significant costs due to repeated injections. These limitations according to Karri et al. encourage the clinicians to use phenol neurolysis and BoNT-A in complement, with neurolysis reserved for proximal nerves and BoNT-A used for distal musculature. Our study showed a significant reduction of spasticity in the ankle plantar flexors and invertors following tibial nerve block with phenol. Therefore, it is our usual practice to offer phenol nerve block for ankle plantar flexor and invertor spasticity if there are no contraindications. We believe that the effects of phenol nerve block last longer, and it is less expensive and as efficacious when compared to BoNT-A injections. However, the safety and efficacy of phenol are less commonly documented in the literature than BoNT-A. Theoretically, tibial nerve phenol block should avoid the development of contractures in ankle plantar flexor and invertor muscles and thus reduce the need to refer patients for surgical interventions (tenotomies and tendon lengthening). However, there is no evidence in the literature to support this view and further research is needed in this area. The tibial nerve block can be performed with nerve stimulator as well as with the help of ultrasound to guide the placement of the needle. The advantage of electrical stimulation is that it provides direct feedback on the proximity of the needle to the target nerve by stimulating the muscles supplied by the nerve and also help in titrating the amount of phenol that can be used. The disadvantage of direct nerve stimulation is that the procedure can sometimes be uncomfortable and painful due to the muscle twitch. The ultrasound helps to visualize the nerve directly and minimizes the damage to the vasculature structures. The advantage of the ultrasound localization is that the phenol could be injected very close to the nerve and away from the vascular structures facilitating lower doses of phenol to produce the desired effects. There is good evidence in the literature that ultrasound is more superior to the electric stimulation with regard to nerve blocks in regional and local anesthesia. The combined use of electrical stimulation and ultrasound to localize the nerve adds to clinician confidence without increasing the efficacy when ultrasound is used alone. This study has several limitations. It is a retrospective study with a small sample size. There is no comparison made between the phenol and BoNT-A injections in reducing ankle plantar flexor and invertor spasticity. Moreover, the duration of the follow-up was only up to 6 months which is very short. Our study suggests that tibial nerve block with phenol could be effective in reducing ankle plantar flexor and invertor spasticity with minimal side effects. We encourage rehabilitation medicine physicians to try this simple procedure which has a good and favorable outcome. Further studies are needed to explore the efficacy, long-term benefits, and side effects of phenol in the management of spasticity. Lance JW. Symposium synopsis. In: Feldmann RG, Young RR, Koella WP, editors. Spasticity: Disordered Motor Control. Miami, FL: Year Book Medical Publishers; 1980. Davies PM, editor. Typical patterns of spasticity or hypertonicity. In: Steps to Follow: the Comprehensive Treatment of Patients with Hemiplegia. 2nd ed. Berlin: Springer; 2000. p. 63-4. Lamontagne A, Richards CL, Dumas F, Tardif D, Comeau F. Larger contribution of passive stiffness to ankle plantarflexor moment during gait after stroke. Soc Neurosci 1997;23:769. Lamontagne A, Malouin F, Richards CL. Locomotor-specific measure of spasticity of plantarflexor muscles after stroke. Arch Phys Med Rehabil 2001;82:1696-704. Anwar F, Ramanathan S. Combined botulinum toxin injections and phenol nerve/motor point blocks to manage multifocal spasticity in adults. BJMP 2017;10:a1002. Worboys M. Joseph lister and the performance of antiseptic surgery. Notes Rec R Soc Lond 2013;67:199-209. Nathan PW. Intrathecal phenol to relieve spasticity in paraplegia. Lancet 1959;2:1099-102. Khalili AA, Betts HB. Peripheral nerve block with phenol in the management of spasticity. Indications and complications. JAMA 1967;200:1155-7. Carpenter EB, Seitz DG. Intramuscular alcohol as an aid in management of spastic cerebral palsy. Dev Med Child Neurol 1980;22:497-501. Gracies JM, Elovic E, McGuire J, Simpson DM. Traditional pharmacological treatments for spasticity. Part I: Local treatments. Muscle Nerve Suppl 1997;6:S61-91. Chua KS, Kong KH. Clinical and functional outcome after alcohol neurolysis of the tibial nerve for ankle-foot spasticity. Brain Inj 2001;15:733-9. Karri J, Mas MF, Francisco GE, Li S. Practice patterns for spasticity management with phenol neurolysis. J Rehabil Med 2017;49:482-8. Wichers MJ. Partial blocking of the tibial nerve with phenol as treatment of gait disorders due to pes equinus in central paralysis. Ned Tijdschr Geneeskd 1991;135:752-4. Deltombe T, Wautier D, De Cloedt P, Fostier M, Gustin T. Assessment and treatment of spastic equinovarus foot after stroke: Guidance from the Mont-Godinne Interdisciplinary Group. J Rehabil Med 2017;49:461-8. Alsuhabani A, Ethans K. Ultrasound guided phenol block of the obturator nerve for severe adductor spasticity: A pilot study. Int J Neurorehabil Eng 2016;3:1-5. Anwar F, Ramanathan S, Khayer A. Complications of peripheral phenol nerve and motor point blocks in the management of spasticity. Int J Ther Rehabil Res 2017;6:1-5. Lee J, Lee YS. 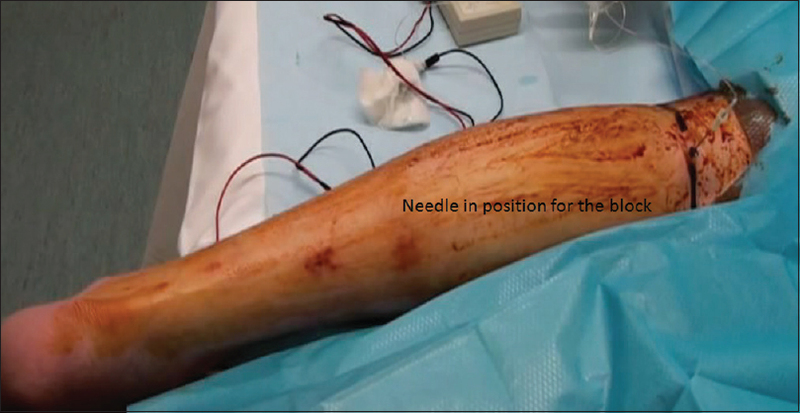 Percutaneous chemical nerve block with ultrasound-guided intraneural injection. Eur Radiol 2008;18:1506-12. Kirazli Y, On AY, Kismali B, Aksit R. Comparison of phenol block and botulinus toxin type A in the treatment of spastic foot after stroke: A randomized, double-blind trial. Am J Phys Med Rehabil 1998;77:510-5. Manca M, Merlo A, Ferraresi G, Cavazza S, Marchi P. Botulinum toxin type A versus phenol. A clinical and neurophysiological study in the treatment of ankle clonus. Eur J Phys Rehabil Med 2010;46:11-8. Kocabas H, Salli A, Demir AH, Ozerbil OM. Comparison of phenol and alcohol neurolysis of tibial nerve motor branches to the gastrocnemius muscle for treatment of spastic foot after stroke: A randomized controlled pilot study. Eur J Phys Rehabil Med 2010;46:5-10. Chin KJ, Chan V. Ultrasound-guided peripheral nerve blockade. Curr Opin Anaesthesiol 2008;21:624-31. Casati A, Danelli G, Baciarello M, Corradi M, Leone S, Di Cianni S, et al. A prospective, randomized comparison between ultrasound and nerve stimulation guidance for multiple injection axillary brachial plexus block. Anesthesiology 2007;106:992-6.